BARRATT AND DAVID WILSON HOMES NORTH WEST SUPPORT LOCAL FAMILIES IN SOUTHPORT – Our Space, Your Place. Leading North West Homebuilders Barratt and David Wilson Homes North West has donated £1000 towards family support charity – Home-Start, in Merseyside to help train new volunteers. The donation was made through the company’s ‘Our Space Your Place’ community initiative. The scheme aims to support community projects and local charities throughout the region. 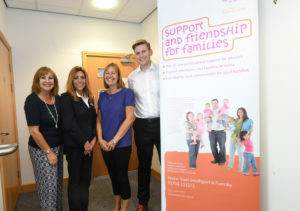 The money donated will be used to provide training to 10 new volunteers who will learn ways to support vulnerable parents and children in Southport. Home-Start is a family support organisation which visits parents with young children offering friendship, emotional support and practical help for those who may be struggling to cope. Many families deal with issues which can have an effect on their ability to manage day to day life. Volunteers from Home-Start will visit a family once a week for two or three hours to provide friendly and caring help. Volunteers offer reassurance and encouragement and help build parents’ strengths until the family feel more confident to tackle issues alone. Parents are then able to stand on their own feet and start to enjoy family life. Since launching ‘Our Space Your Place’, Barratt and David Wilson Homes has worked on a number of projects with schools and charities, including Liverpool’s Alder Hey Children’s Charity, Tarporley CE Primary School, Elworth Hall Primary and The Wingate Special Children’s Trust. Barratt and David Wilson North West is currently building homes in Merseyside at Pavilion Gardens and Victoria Mews. Three and four bedroom homes are now available at Pavilion Gardens priced from: £216,995. For more information on any of these homes, please visit the website at: www.dwh.co.uk/paviliongardens. Three bedroom homes are now available at Victoria Mews priced from: £105,995. For more information on any of these homes, please visit the website at: www.barratthomes.co.uk/victoriamews. For more information on any of the homes, please call the sales hotline on: 08448113366.